Dec 21st, 2018 it was a Friday and the Holidays just started. Elisabeth will turn 18 on the 28th of Dec. Medieval Life and Renaissance was her life and she studied it since she was a child. She knew everything about it, all the history and dates. Modern life of electronics and computers never interested her but she still learned all the basics so she could do research online. She never liked the fast life that she is in. She sometimes wished she was born in the time of Renaissance. Where life was not so fast and people were more loving, as she thought. But soon she will know that the grass is not greener on the other side. Her grandfather comes out with a secret that will change her life forever. He had to wait until she turned 18. To tell her the hidden truth about their family and its past. After they had her 18th birthday celebration. Everyone had left and she was now alone with her grandfather. Curious, confused, and scared, Elisabeth was taken by the hand and lead into his study. A room that she never entered before. (a room that was forbidden) With great curiosity. she looked around the room. (a medieval structure) Her grandfather handed her a Journal that he had written through his life. She gazed down at the book and looked up puzzled at her great grandfather. Standing next to the Dimension hole in the wall, Her vision was drawn to another world on the other side. Should she go through the whole in the wall? Is she ready to find out the truth? Is she strong enough to follow it through and enter something that will change her whole existence. Will she meet the man of her dreams? The one dream she been having all her life? Was it dreams she been having or a way to the future. Below are some samples of the poetry I wrote The book will soon be published.. I knew we will get threw it all. Is there a word called Love? When I met you I knew I´ll no longer be blue. Even is we can not be! Salem, Massachusetts Birthplace of many witches. The year is 1930, and four young girls were born the same time and date, at the NSMC hospital. The names of the girls were Crystal, Karen, Jenny and Patty. Since that day they were best friends, they just connected. Crystal has blonde hair and blue eyes, Karen jet-black hair with dark brown eyes, Jenny brown hair and hazel eyes, and Patty with bright red hair and green eyes. They were always together; you just couldn’t get them to part. Allot of people thought that it was strange. Family and good friends knew all about them and that it was just a great friendship. It is now 1940 and World War 2 has just started to be known. The girls are now 10 years of age and things started to happen and the girls will grow up faster than they thought. All the girls grew up in the Wiccan religion and believed in it very much. They shared every Sabbath and stories. These girls always where up to something. Then one day a new family moved into the old house of Mrs. Diler and that’s when this story begins and the thought about life and death changes…Nobody knew that Mrs Diler had a family and now a new door opens up to the community. Hagen is a 17 year old boy from the planet Amuler. He’s a Clipton and the kings son. He is very small to all the other Cliptons, but that does not bother him at all. 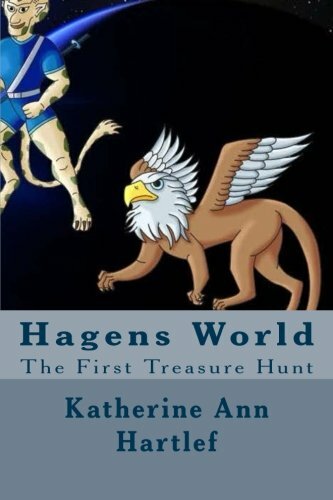 Hagen has a dream to travel to all the planets to find their greatest treasure and someday that dream will come true. As like any other teenager his age he will fall in love, do sports, and have fights. HUH! Fights you say? Yes, Hagen will have plenty of fights in his school days and journeys. As we all did or do have trouble with one kid that always starts trouble. Hagen too had trouble with one kid But he fought with his mind not his fist. Hagen does not like violence. His father does not like that Hagen does not defend himself. Hagen is the only child in his family and he has no choice but be king someday. On Hagens journey he will meet friends and make enemy’s. Soon he will have his dream come true and he will also get more than what he wants. What does Hagen look like? Well, he has dark green skin, and the texture of humans skin. He has a funny shape head it’s like a humans but bigger, his body has the shape of a lion. How was Hagen created? Hagen was made from my Imagination. He has allot of my kids in him.. He has the personality of all of them. He has the Courage from my son Gilbert, He has being stubborn from my daughter Jessica, the Gentleness from Bianca, and being the Joker from my son Marc. What planet did Hagen come from? Hagen is from the planet Amuler. It’s a earth like atmosphere but it never rains. Read his books, follow him on his journeys and he will meet new friends and also make enemies.